The Tri-Centric Orchestra, the resident ensemble of Anthony Braxton’s Tri-Centric Foundation, will present the world premiere of Braxton’s Composition No. 27 (1973), and three newly commissioned works by composers Taylor Ho Bynum, Ingrid Laubrock, and Mark Taylor, for a 35-piece orchestra and 10-voice choir conducted by Bynum. The Tri-Centric Orchestra was founded by Anthony Braxton for the recording of the opera Trillium E in the spring of 2010. The project brought together an extraordinary community of creative artists: a family of artists 60-musicians strong, equally comfortable improvising and interpreting the most rigorous notation, wholly committed to pursuing a new American music. 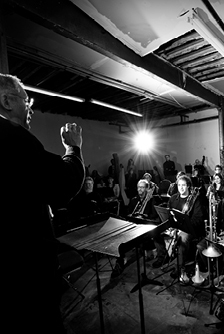 The positive energy of the ensemble inspired the Tri-Centric Foundation to recognize the group needs to be a permanent entity, dedicated to performing the large ensemble works of Braxton and similarly forward-thinking composers, as well as developing the composers and conceptualists within its own ranks. Anthony Braxton has boldly redefined the boundaries of American music for more than 40 years. Drawing on such lifelong influences as jazz saxophonists Warne Marsh and Albert Ayler, innovative American composers John Cage and Charles Ives and pioneering European Avant-Garde figures Karlheinz Stockhausen and Iannis Xenakis, he created a unique musical system, with its own classifications and graphics-based language, that embraces a variety of traditions and genres while defying categorization of its own. From his early work as a pioneering solo performer in the late 1960’s through his eclectic experiments on Arista Records in the 1970’s, his landmark quartet of the 1980’s, and more recent endeavors, such as his cycle of Trillium operas, a piece for 100 tubas and the day-long, installation-based Sonic Genome Project, his vast body of work is unparalleled.